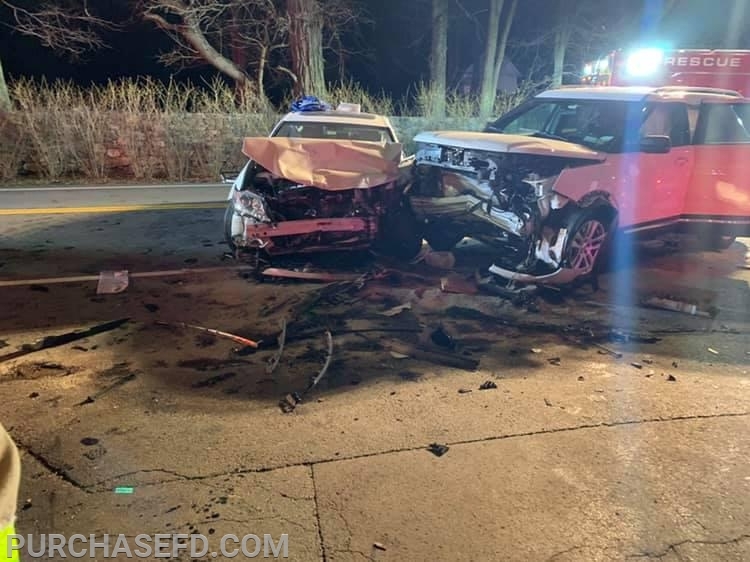 After wrapping up our weekly Wednesday night drill, the Purchase Fire Dept along with Harrison EMS were dispatched to a motor vehicle accident with extrication. Units arrived on-scene to find a two car accident with two parties requiring extrication in front of 3095 Purchase Street. Members of Rescue 30 stabilized the vehicles and operated the Jaws of Life to remove the trapped victims. Engine 240’s crew split into two teams assisting Harrison EMS with patient care & stretching a precautionary hose line. EMS transported the patients to local hospitals and the roadway remained closed for a prolonged period of time.